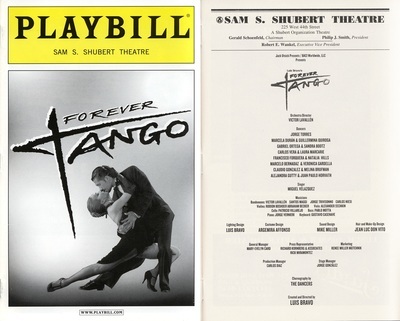 A partir de Broadway, New York 2004, Alejandra forma parte de “Forever Tango” de Luis Bravo. Con el show se presentó en prestigiosos escenarios del mundo: "Shubert Theatre" en New York, "Kodak Theatre" en Hollywood, "Cerritos Center For The Performing Arts" en Los Angeles, "Jackie Gleason" en Miami, "Shanghai Grand Theatre", "Taipei National Theatre", entre otros. En el 2007 Alejandra participó del especial en DVD "Forever Tango, Live From Teatro Coliseo Podestá", para DPTV Detroit Public Television y APT American Public Television. Entering Broadway, New York in 2004, Alejandra became part of Luis Bavo´s “Forever Tango”. Performances in prestigious theatres throughout the world: "Shubert Theatre" in New York, "Kodak Theatre" en Hollywood, "Cerritos Center For The Performing Arts" in LA., "Jackie Gleason" in Miami, "Shanghai Grand Theatre", "Taipei National Theatre", just to name a few. In 2007 Alejandra participated in the DVD production "Forever Tango From Coliseo Podestá" for DPTV Detroit Public Television and APT American Public Television.